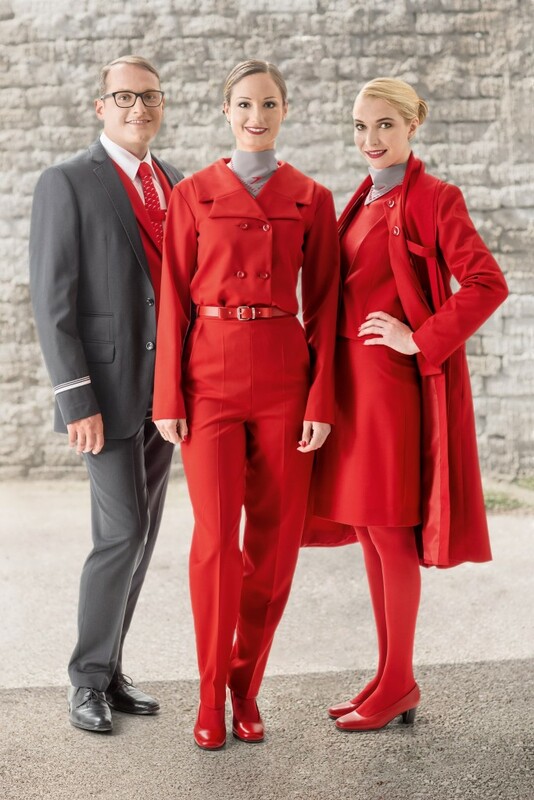 The new uniform, which will be worn by about 3,500 Austrian Airlines employees in uniform highlighting the airline’s red color at the Austrian Airlines ground stations (airports) and on board, was designed by the Austrian designer Marina Hoermanseder. She prevailed against several top designers from Austria by presenting the best concept. Born in Vienna, Hoermanseder has lived and worked in Berlin for several years. Her fashion creations stand for a pronounced individualism and fuses technical refinement with an exalted and elegant design. According to the designer’s ideas, the rich red color will continue to be part of the Austrian Airlines uniform. The female employees in red will vote over the next four week whether to retain the red color of the shoes and stockings. “Creating the design for the Austrian Airlines uniform was a very exciting task for me, and as an Austrian gave me a great deal of joy. In any case, I wanted to retain the bright red of Austrian Airlines because it gives the crew members a strong appearance”, says the designer Marina Hoermanseder. Austrian Airlines employs a staff of approximately 6,000 employees, of whom 3,500 wear a uniform. In addition to the logistics requirements, the quality of the material also plays a crucial role. Every part of the uniform is subject to washing and wearing tests and laboratory analyses before being approved. A separate working group will support the launch of the new uniform and also play an important role. “Our employees are the business card of Austrian Airlines. With the unmistakable uniform they are recognized at all airports worldwide. I’m looking forward to the further development and a new, modern Uniform style. Alone in 2014, we have spent more than 51,000 red Uniform pieces and accessories“, says Amir Aghamiri, Head of Brand Management at Austrian Airlines. After receiving her Master of Business Administration, Vienna-born Marina Hoermanseder studied fashion design at ESMOD Berlin and also attended advanced courses held at Central St. Martins College in London. Following a successful internship with Alexander McQueen and various shows at the Salon de Cuir in Paris, the Berlin-Dubai Fashion Festival of the Goethe Institute, the London Graduate Fashion Week and the Portugal Fashion Week, she first showed her own collection in 2014 at the Mercedes-Benz Fashion Week in Berlin and the Fashion Scout in London.